Unlike other insurance carriers, West Bend Auto Insurance covers your vehicles and home on one policy. You'll have the same, and often more, coverages for your vehicles than you'll find on a stand-alone auto policy. Since we insure all of your personal valuables on one policy, you pay only one premium. And our convenient payment options make it very easy to pay that one premium. The Home and Highway also provides coverage for motorcycles, antique/classic cars, motor homes, and trailers on the auto portion of your policy. As a Home and Highway policyholder, you can purchase an additional coverage to protect you and your loved ones while you're on the road. TravelNet is our exclusive 24-hour emergency roadside service. You're cruising down the highway in your 1966 Ford Mustang convertible. The top is down, the sky is clear, and the road stretches for miles. Suddenly you hit gravel and a stone shatters your windshield. It's going to take some major repairs to get your classic beauty back on the road. Don't worry! Your classic vehicle is used far less than your standard auto so you should pay less to insure it. You won't have to pay a deductible if you have a claim with your classic vehicle. Use your vehicle as you wish. The Home and Highway policy gives you the flexibility to use your vehicle beyond the limits of a parade or exhibition. Go ahead and enjoy a weekend drive just because you want to! 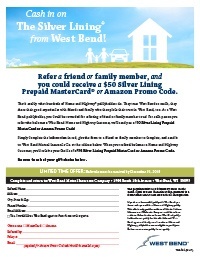 Refer a friend or family member, and you could receive a $50 Silver Lining Prepaid Mastercard or an Amazon Promo Code!